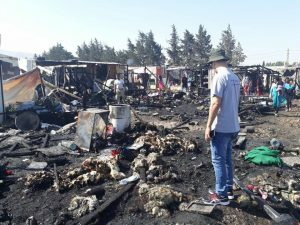 Lebanon (MNN) — Recently, we shared a report from the ground about the recent fires that destroyed several homes in two separate Syrian refugee camps in the Bekaa Valley of Lebanon. Heart for Lebanon has been ministering to the families who were victims of the second fire on July 4th. This ministry is a friend and partner of SAT-7, a Christian satellite television ministry to the Middle East and North Africa. As we shared previously, 25 tents burned up in the fire, and one little girl was killed. It’s since been confirmed that the fire started as a result of an overloaded telephone line where families had been syphoning electricity. The family who lost their daughter, Hagar, held her funeral last week. Heart for Lebanon has been meeting with them and other families affected by the fire. But help is coming from other refugees as well. Atema says in the Middle East, there is a heavy emphasis on family. Because of this, there is a great sense of care among the families living in this tent community. “The people opened up the little room they had and said, ‘Come on and join us, we’ll share our food,’” he shares. 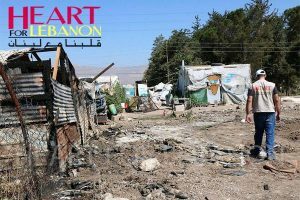 Heart for Lebanon has provided more food. They’re also assisting families to rebuild the tents. Additionally, the ministry is footing medical bills for the people who were severely burned in the fire. Syrians have been at the mercy of Lebanon’s hospitality for several years now. Atema says they’ve received a mixed welcome. Some, he explains, have not embraced the refugees. “There are others that, whether they’re Christian or Muslim, will not embrace Syrian refugees because they can’t forget the past, for one reason or another,” he says. This sentiment is exacerbated by another struggle. This is a pretty common scenario, and that’s what makes aid organizations so valuable. Atema says there are quite a number of groups who’ve reached out to the Syrians in their time of need. These organizations are able to offer a hope that is not based on humanitarian aid — the Gospel. Additionally, local churches who have moved past any bad history between the two nations to serve with unconditional love. There are also several secular NGOs who’ve been providing aid. 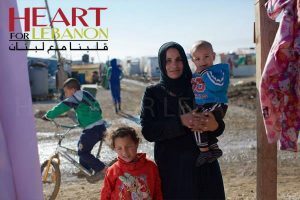 You can also be praying that the Church in Lebanon continues to minister well to the refugees. For more information on SAT-7, click here.